Standard scores indicate where your score lies in comparison to a norm group. For example, if the average or mean score for the norm group is 25, then your own score can be compared to this to see if you are above or below this average. A percentile score is another type of converted score. Your raw score is converted to a number indicating the percentage of the norm group who scored below you. For example, a score at the 60th percentile means that the individual's score is the same as or higher than the scores of 60% of those who took the test. The 50th percentile is known as the median and represents the middle score of the distribution. Percentiles have the disadvantage that they are not equal units of measurement. For instance, a difference of 5 percentile points between two individual’s scores will have a different meaning depending on its position on the percentile scale, as the scale tends to exaggerate differences near the mean and collapse differences at the extremes. Percentiles can not be averaged nor treated in any other way mathematically. However, they do have the advantage of being easily understood and can be very useful when giving feedback to candidates or reporting results to managers. 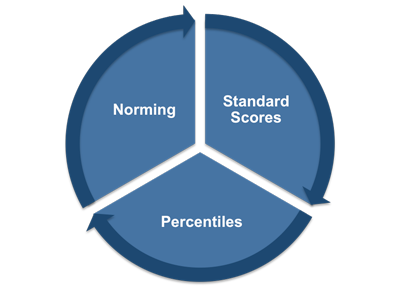 If you know your percentile score then you know how it compares with others in the norm group. For example, if you scored at the 70th percentile, then this means that you scored the same or better than 70% of the individuals in the norm group. This is the score most often used by organizations when comparing your score with that of other candidates because they are so easily understood they are very widely used when reporting results to managers. The characteristic way that test scores tend to bunch up around the average and the use of percentiles in the interpretation of test results, has important implications for you as a job candidate. This is because most aptitude tests have relatively few questions and most of the scores are clustered around the mean. The effect of this is that a very small improvement in your actual score will make a very substantial difference to your percentile score. There are several different norming systems available for use, which have strengths and weaknesses in different situations. These can be grouped into two main categories; rank order and ordinal. To overcome the problems of interpretation implicit with percentiles and other rank order systems various types of standard scores have been developed. One of these is the Z-score which is based on the mean and standard deviation. It indicates how many standard deviations above or below the mean your score is. The illustration shows how Z-scores in standard deviation units are marked out on either side of the mean. It shows where your score sits in relation to the rest of the norm group. If it is above the mean then it is positive, and if it is below the mean then it is negative. As you can see from the illustration, Z-scores can be rather cumbersome to handle because most of them are decimals and half of them can be expected to be negative. Since T-scores do not contain decimal points or negative signs they are used more frequently than Z-scores as a norm system, particularly for aptitude tests. The Sten (standard ten) is a standard score system commonly used with personality questionnaires. Stens divide the score scale into ten units. Each unit has a band width of half a standard deviation except the highest unit (Sten 10) which extends from 2 standard deviations above the mean, and the lowest unit (Sten 1) which extends from 2 standard deviations below the mean. Sten scores can be calculated from Z-scores using the formula: Sten = (Zx2) + 5.5. Stens have the advantage that they enable results to be thought of in terms of bands of scores, rather than absolute scores. These bands are narrow enough to distinguish statistically significant differences between candidates, but wide enough not to over emphasize minor differences between candidates.